At a ceremony with Harry E. Johnson, Sr., President of the Washington, DC Martin Luther King, Jr. National Memorial Project Foundation, Inc., Christine King Ferris, sister to Martin Luther King Jr.; EPA Administrator Lisa Jackson and members of the Black and Hispanic Caucuses, Secretary of the Interior Ken Salazar today signed a permit allowing construction of the Martin Luther King, Jr. Memorial on the National Mall. “Dr. King is one of America’s greatest heroes – a Nobel Peace Prize winner who inspired America to live up to the meaning of its creed of freedom, justice and opportunity for all people,” said Secretary Salazar. “It is fitting and appropriate that we honor Dr. King’s extraordinary life and legacy with a memorial here on the National Mall, alongside the timeless landmarks of American democracy and freedom. May this sacred ground help us draw strength from Dr. King’s courage, dedication and sacrifice, and inspire us to always seek a more perfect union.” “I am excited to move forward with construction and share that we are in the home stretch of the fundraising campaign to build this national memorial to Dr. King,” said Harry E. Johnson, Sr., President of the Washington, DC Martin Luther King, Jr. National Memorial Project Foundation, Inc. “I call on all Americans to participate in our Build the Dream: Countdown to Completion phase of the fundraising campaign by donating $1 or more to become a part of history.” Now that Secretary Salazar has signed a construction permit, the non-profit Washington, DC Martin Luther King, Jr. National Memorial Project Foundation, Inc. can proceed with construction of the memorial. The new memorial will be situated adjacent to the Franklin Delano Roosevelt Memorial and in a direct line between the Lincoln and Jefferson Memorials. Dr. King delivered his famous “I Have a Dream Speech” at the Lincoln Memorial in August, 1963. Congress passed Joint Resolutions in 1996 authorizing Alpha Phi Alpha Fraternity, Inc. to establish a memorial honoring Dr. King to be built in Washington, D.C. The ceremonial groundbreaking took place on November 13, 2006, and the memorial is expected to be completed in 2011. The design of the four-acre memorial includes the use of water, stone and trees to symbolize Dr. King’s call to America for justice, opportunity and hope for all people. 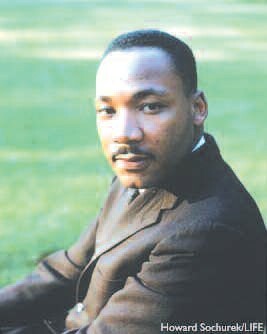 Dr. King, a Baptist minister, dedicated his life to promoting civil rights and opposing discrimination and segregation. In 1964, he became the youngest person to receive the Nobel Peace Prize for his work to end segregation and discrimination by peaceful protest and other non-violent means. King was posthumously awarded the Presidential Medal of Freedom in 1977 and Congressional Gold Medal in 2004. Congress established Martin Luther King, Jr. Day as a U.S. national holiday in 1986.